In an age of bleak but sassy as hell Victorian period dramas, this adaptation of the Joseph Conrad novel has a lot too live up to. Verloc (Toby Jones) is a Soho pornographer who does a bit of work on the side spying on dissident Russian anarchists for the Russian Embassy. Soon though, they want to up the ante and order him to carry out the bombing of the Greenwich Royal Observatory. The expectation is that the British law will then come down heavy on the anarchists. 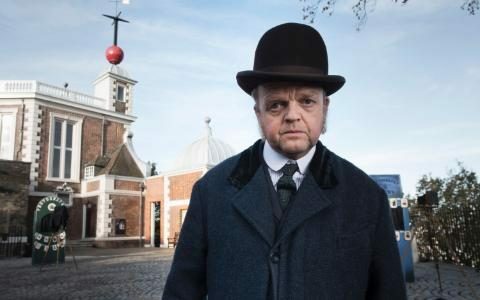 Where shows such as Ripper Street and Peaky Blinders thrive of modern stylistics and quicker editing than the eras they cover would have ever known possible, The Secret Agent chooses to take its time. You could say it’s a slow burner (if you were to make a really bad pun). Maybe it’s the familiar faces skulking around familiar sets that puts the shackles on embracing this greyly-lit fantasy world too wholeheartedly. The cast list is impressive on paper: David Dawson has nipped over from Ripper Street to nefariously greet what seems like half of the This Is England gang. Toby Jones and Vicky McClure head proceedings in the form of the odd couple who are supposedly married but we never get the impression she’s anything more than his cleaner. It all looks moody and spectacular but one can’t shake the feeling we’re seeing actors playing roles they’ve played before in more rustic settings. For all Verloc’s conflicted angst it would not be a surprise if he suddenly threw a metal detector to the floor before asking Andy if he wants to go to the pub. It also felt like Stephen Graham should be accompanied by a Stone Roses bassline as he strode purposefully to the bar (the Danebury Metal Detecting Club presumably just out of shot having their quiz night). It fuels the fire for those who say the BBC employs the same actors again and again. The end result is akin to watching a play at the theatre but being distracted by the stage hands moving the set about instead. The show is quite good but you’re too busy obsessing over the mechanics rather than the story. McClure’s character Winnie was so underwritten it can only be classed as a waste of one Britain’s most in demand actors. Wasn’t this really just a spin-off of Dickensian? Who else was trying to spot modern buildings and cars in the vast city shots?